Juno's orbit enables it to pass over both Jupiter's poles. The Gravity Assist Podcast is hosted by NASA's Director of Planetary Science, Jim Green, who each week talks to some of the greatest planetary scientists on the planet, giving a guided tour through the Solar System and beyond in the process. This week, he is joined by Dr Jared Espley, who is a planetary scientist at NASA's Goddard Space Flight Center, and also the program scientist on Juno, one of planetary science's fantastic missions, currently orbiting Jupiter. Jared Espley: We actually don't know that, Jim. That's one of the really cool things in science, we don't know exactly how Jupiter formed and how planets in general form throughout the Universe. So, that's what the Juno mission is designed to do, to try and help us understand how planets form, in general. Part of the answer, of course, is that gas condensed into the solar nebulae to form Jupiter, but under what circumstances that happened and why Jupiter is the largest planet in our Solar System, we just literally don't know. Jim Green: We think that as the planets were created and Jupiter obtained most of the gases, that it would have or could have rivaled the Sun at one time in terms of being able to turn on and become another sun. Since a large percentage of stars in our Galaxy are double stars, perhaps Jupiter was a failed sun. Jared Espley: Yeah, that's right. I mean, basically, you just need to get enough mass to ignite nuclear fusion, of course. Jupiter didn't quite get there. Jim Green: I think the calculation is that it takes about 80 times the mass of Jupiter to get it to the point where it'd become a sun. One of the most iconic and fascinating features of Jupiter is its Great Red Spot. Juno's really learned a lot about the planet as it's passed over very close [to its atmosphere], and it passed over the Great Red Spot in summer 2017. What did we find out? Jared Espley: We've seen a lot of images of the Great Red Spot over the years, but Juno has all these instruments that are specifically designed to look underneath the clouds of Jupiter, and we used those instruments to look at the Great Red Spot. What we found, in particular with the microwave radiometer that can see the microwave emissions coming from deep down in the atmosphere, was that it was warmer very deep beneath the Great Red Spot, way down into the deep atmosphere, hundreds of kilometers deep. So clearly [the storm] has roots, there's sources of atmospheric turbulence down below, the details of which are being worked out. But it means that not only is it an iconic storm at the surface but it goes deep down into the atmosphere. Jim Green: Optical astronomers have been using telescopes to observe Jupiter for hundreds of years and they have been finding that the Great Red Spot is shrinking. What's been happening? Do we know yet? Jared Espley: I don't think we really do. Again, that's one of the awesome things about science: there is always mysteries. Like you say, observationally, we can see clearly that at the surface it's shrinking. Whether the roots deep down have been growing or shrinking, we have no idea because, of course, we only have those recent measurements from Juno. But, we want to keep tracing that and to be able to see the evolution of this gigantic storm over the next decade or so and see how that compares with the past few hundred years. Jim Green: One of the really exciting instruments on Juno that I really love is the Waves instrument. That's an instrument that makes measurements of electromagnetic waves, and we've got a process by which they take those electromagnetic waves and convert them into sound, and that's really been a fascinating opportunity for us to listen to the sounds of Jupiter, listen to the sounds of space. What do those sounds tell us? Jared Espley: The waves that we are typically recording are electromagnetic waves produced by the different energetic particles that are found at the different planets, and they produce different types of waves. In some cases they can be also be related to lightning activity. We have whistler waves at Earth. We have these at Jupiter, as well. But like you say, the audio version just makes this really eerie space music. Jim Green: As the big guy on the block, Jupiter also seems to have most of the moons. How many moons does Jupiter have? Jared Espley: We think it has dozens, 50, 60 moons [67 confirmed moons], but it has four major satellites, the Galilean satellites that were discovered by Galileo hundreds of years ago. Those moons are particularly interesting to us because they are full worlds in their own right and have really interesting features: oceans, ice, tenuous atmospheres. So, they're really fascinating moons. Jim Green: Yeah, they're huge. I think Europa, which is the smallest of the four, is just a little smaller than our own moon. And Ganymede is the largest moon in the Solar System, plus it has its own magnetic field. One of the things that the moons do, of course, is that as they orbit the planet, they really connect to the magnetic field of Jupiter, and that produces all kinds of effects. What are some of those things? Dr. Jared Espley, program scientist on the Juno mission to Jupiter. Jared Espley: It's really neat how the magnetic field does that connection between the moons and Jupiter itself, because one of the main things that we think is happening is that material from some of the moons, Io in particular, is being lofted into space. Giant volcanoes on Io are blowing material into space. That material becomes ionized, loses an electron and then gets entrained in the magnetic field and driven back into Jupiter. So, there's a literal physical connection between a moon, Io, with volcanoes blowing stuff into Jupiter. When that happens it produces aurorae that we can see at Jupiter, those northern and southern lights. So it's just an awesome connection between geology, space physics and Jupiter itself. Jim Green: Jupiter's magnetic field is really quite different to the magnetic fields that we're used to around some of the other planets, but it also gives us an opportunity to study where the magnetic field is generated. What are we learning about Jupiter's magnetic field? Jared Espley: As I've said, Juno is designed to look inside Jupiter and one of the ways it does that is through the magnetic field, like you mentioned. With our instruments on board Juno we are learning that the magnetic field at Jupiter is even more complex than we originally thought. It's got this global planetary magnetic field that we knew something about to begin with, but it looks like there's even more structure going on there. So, there may or may not be multiple places where the magnetic field's originating, something deep inside and something maybe a little closer to the surface. We're starting to just disentangle that now. 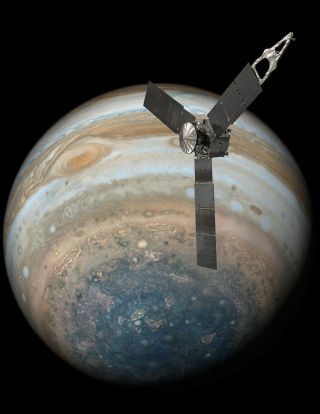 Jim Green: Perhaps that is related to the core of Jupiter, and Juno is designed through its gravity measurement to make some of those measurements. What are we finding out about the size of Jupiter's core? Jared Espley: Yeah, exactly; both the gravitational and the magnetic fields are ways to probe Jupiter's deep interior. We're starting to revise the classic picture that we've always had in our mind where we thought there might be a dense rocky core in the center surrounded by really, really condensed hydrogen and helium, a metallic layer [hydrogen under enough pressure takes on 'metallic' properties, such as becoming an electrical conductor] and then the lighter layers of gas above that. The gravity measurements are starting to really upend this classical view, and it looks like it may just be more well mixed down there. There may not be the classic rocky core that we thought. But, honestly, there's a lot of controversy and discussion going on right now within the science team, which is what you want. You want to have scientists arguing because that's what's fun. A complex, writhing storm system in Jupiter's northern hemisphere. Jim Green: One of the things that Jupiter's got that are just absolutely spectacular are the beautiful cloud structures. What is Juno finding out about these? Jared Espley: While we have a lot of interest to look inside [Jupiter], we also happen to have this instrument, the JunoCam instrument, which is creating these amazing pieces of data and art at the same time. Some of those images are just beautiful to look at, and some of them are really revealing new science. A lot of that's in the polar regions because we're getting really good imagery at the poles that we didn't have before. And we're starting to see all these storms, these vortices that are swirling around the polar regions. JunoCam's really starting to tease out how the polar atmosphere is working. Jim Green: How come we didn't see these before? Is this something new? Jared Espley: It is because almost all of our imagery either comes directly from Earth, of course, where we have the Hubble Space Telescope or even the backyard telescopes that the listeners might have, where you can look at Jupiter [from an angle almost level with its equator]. So we're able to see the side view of Jupiter, and it's almost impossible to see the top view unless you happen to have a spacecraft there flying directly over that top view, which we do in the shape of Juno. The southern hemisphere of Jupiter, with several 'white oval' storms. Jim Green: It was a real nail-biter when Juno really arrived at Jupiter on 4th July 4th 2016. How tricky was it for engineers to get that spacecraft into orbit? Jared Espley: Well, of course, there's millions and millions of things that you have to do right to make a spacecraft work, and that it has all worked perfectly is a testament to our engineering colleagues. The actual event itself was the fire of the rocket engine, and they did it at precisely the right time and for precisely the right amount of time. It was superficially easy, but there's millions of things that have to happen right to get you to that point. Jim Green: Juno's in a 53-day orbit that gives us fabulous close encounters over a two-hour period, and then we spend a lot of time planning instruments and doing other things. What's happening during the rest of its orbit? Jared Espley: Like you said, Juno gets super-close to Jupiter every 53 days, and makes a lot of these interior measurements we've been talking about. But, one of the other major science goals is to try and understand the near-space environment at Jupiter, what we call the magnetosphere. And in the magnetosphere, are all these particles and waves like we talked about before, which create those really awesome sounds from the Waves instrument. We want to try and understand how the magnetosphere works, so we're taking continual data all throughout the orbit, especially with the magnetosphere-oriented instruments when we're far away from the planet. Jim Green: Compositionally, Jupiter and Saturn are pretty similar. We call them the gas giants, dominated by hydrogen and helium mostly. But based on their cloud shapes, they're very different, particularly in the northern hemisphere. What's the difference? Jared Espley: Using JunoCam we've started to see polar vortices swirling around the north and south poles of Jupiter. At Saturn, there's this hexagon, which is a really interesting storm that really catches your eye because you don't often see angular features in nature like that. The storms are produced by the cloud features the wind patterns of their respective planets, and I think that's something scientists are really interested in looking at in more detail. Jim Green: Jupiter is, as we said, the big guy on the block, the planet that has got the most gas. It's also pretty huge in size, and attracts small bodies that pass by, such as asteroids and comets. What's been happening over time as we've been observing Jupiter and these small bodies? Jared Espley: As we've observed Jupiter, we've actually even seen some of those small bodies be pulled in by Jupiter's gravity. In particular, back in the 1990s, there was a comet [Shoemaker—Levy 9] that got pulled in very close and ripped apart. There were some fantastic images that were taken, back in 1994, of how [the fragments of] this comet impacted into Jupiter and created what looked like bruises in the planet's clouds. Over the lifetime of the Solar System this has happened millions of times over billions of years as small bodies get pulled in. Many people think that, by having a large planet out there, it in some ways shields the inner planets from heavy bombardment by comets and asteroids. But, there's actually a little controversy about that. People still haven't really worked out exactly all the mechanics of how that works. But certainly, it's interesting to see how large planets can affect the bombardment history of the other planets. Jupiter's Galilean moon Ganymede is the largest moon in the Solar System, and harbors an underground ocean. Jim Green: Jupiter is further out than the Asteroid Belt and its massive gravity is also pushing asteroids around. It either takes those and pulls them out of the Solar System or throws them inward. So, you're right — the controversy is, is Jupiter really helping us that much when, in reality, it's scattering asteroids out of the Asteroid Belt and having them come inward where they can potentially threaten Earth. Jared Espley: Exactly. It would be interesting to compare and contrast and try to get our modeling to try and understand a little bit better what those effects are. Again, that goes to the big picture of what roles do planets have in solar systems, not just our own but in many of those solar systems that we see elsewhere and what the histories of those solar systems would be and how they would be protected from impacts. Jim Green: Jupiter also has certain gravitational nulls that orbit with it around the Sun. We call them Lagrange points. Why are they important? Jared Espley: Those are places where the gravity between Jupiter and the Sun approximately cancels out just because they're both competing and it averages out. And so objects that naturally enter into those locations would stay more or less stable and there are now a lot of small bodies, a lot of asteroids, that have collected in those places. We call them the Trojan asteroids. We actually have some upcoming missions that'll be trying to visit some of those asteroids. Jim Green: Yes indeed, the Lucy Mission is really all about going to L4, Lagrange point number 4, and L5, Lagrange point number 5, on either side of Jupiter in its orbit and visiting many of those Trojans. It was thought that those Trojans were perhaps asteroids, but they could be Kuiper Belt objects, comets. So, by going out there and really taking a good look at them, we'll try to understand how they have been trapped and maybe that'll give us an indication of the evolution of our planetary system. Jared Espley: Yeah, exactly, because we have a lot of small bodies of different types, like you mentioned. They all tell a different story about the history of the Solar System. Jim Green: In 1610 Galileo took a look at Jupiter with his telescope, and he was really surprised. He saw objects that were very close [to Jupiter] and studied those, and it turns out they were huge objects. Today, we call them the Galilean moons. What do we know about them? Jared Espley: Those four major moons that Jupiter has are really significant worlds in their own right. I mean, they're the moons of Jupiter, which would make them interesting, but each one of them — in order, Io, Europa, Ganymede and Callisto — are the moons that are potentially some of the most interesting in the Solar System. They are particularly interesting because they have all these really interesting features like volcanoes, subsurface oceans, ice on the surface. There's all these really interesting features that we really like to try and explore in these worlds. Jim Green: Ganymede, which is the largest moon in the Solar System, has its own magnetic field. How cool is that? Jared Espley: It is awesome, and I say that as a person who studies magnetic fields for a living. Jim Green: Out of those four Galilean moons, which are all special, there's one that's really intriguing, and that's Europa. What can you tell us about that? Jared Espley: Europa is a really interesting place. We know that it has a surface of ice, with cracks in that ice, with red streaks on it, and we know indirectly that there is a sub-surface ocean of liquid water underneath that icy shell. How thick that ocean is, how deep it goes, we don't know. What's in that ocean we don't know, but it's a really fascinating place, because on Earth every place where we find liquid water on Earth, there's life. So, the natural question is, is there life at Europa? Nobody knows, but it'd be awesome to find out. NASA will launch a mission to Europa, called Europa Clipper, next decade. Jim Green: We're working on a mission right now called Europa Clipper that's planned to be launched in the early 2020s, and we're determined to find out. We're getting some beautiful images of Jupiter from Juno, and they're all rendered by the public. How is that happening? Jared Espley: That's one of the really neat things about the Juno Mission, which is that it has this camera, JunoCam, and its images are specifically designed to be processed by the public. We requested that the public help us out with that, and they're doing a fantastic job. You can download the raw images and then rework them into an interesting technical result or even an interesting artistic result, and there have been lots of people doing that. It's all freely available on the web. If people just do a search on Juno or JunoCam, they can find the archive, and they can help be part of history, making new images from Jupiter. Jim Green: Actually, the team is really encouraging a lot of the amateur astronomers to look at Jupiter during certain times. Jared Espley: That's right. People observing here on Earth can use their own telescopes to look up into space and to see and then you can compare and contrast that with what our space robot is collecting there in orbit. Jim Green: I ask every one of my guests a very important question, and that what was that "gravity assist" that propelled them into their field. Jared, what happened with you? Jared Espley: Like many of us, I've been fascinated by space since I was a little kid. My dad was a big science fiction fan, so I always enjoyed going to science fiction conventions and reading science fiction with him. Then I realized that, in order to study space, you had to learn about physics and about math, and so I did that. Then I've just been at the right place at the right time ever since. I went to graduate school to do physics and was working with data from a NASA mission, Mars Global Surveyor, which naturally led to working as a post-doctoral research up at Goddard [Space Flight Center]. They couldn't get rid of me, and I've been there ever since. It's the right place at the right time and being interested in space I think is how I got to where I am.